Jodorowsky’s science fiction comics came out of his abortive adaptation of Frank Herbert’s Dune (see Frank Pavich’s excellent 2013 documentary, Jodorowsky’s Dune). The creative team Jodorowsky assembled to work on set design and costumes for the film consisted of Moebius, Chris Foss, and H. R. Giger. Dan O’Bannon was to provide special effects, and Pink Floyd and Magma were to compose the soundtrack. The cast was to include Salvador Dalí as Emperor Shaddam IV, Orson Welles as Baron Harkonnen, and David Carradine as Duke Leto. 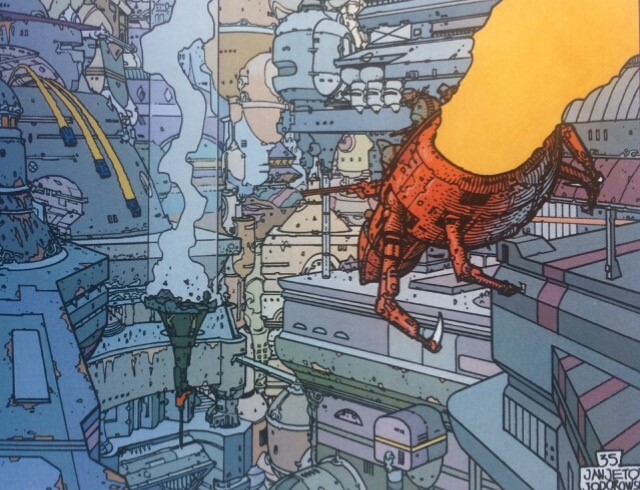 Over the course of two years, Moebius created more than three thousand drawings for the film. Jodorowsky proposed to Moebius that they recycle their work on Dune by collaborating on a graphic novel. Thus, The Incal was born. Jodorowsky went on to author many more science fiction comics, all set in the same vast universe, or “Jodoverse.” Like Dune, the Jodoverse comics blend the conventions of space opera with mysticism and manifest an archeofuturist sensibility. The Jodoverse comics include The Incal, Before the Incal, Final Incal, The Metabarons, Weapons of the Metabaron, Metabarons Genesis: Castaka, The Metabaron, The Technopriests, and Megalex. Humanoids Publishing has also issued two reference guides to the Jodoverse (Deconstructing the Incal and Deconstructing the Metabarons) and a 112-page volume collecting excerpts from the Jodoverse comics for those who wish to sample them before diving in. The saga of the Incal consists of The Incal, Before the Incal, and Final Incal. The plot revolves around a private detective named John DiFool who is in possession of the Incal, an extremely powerful, pyramid-shaped crystal. The Incal was given to him by a dying Berg (a bird-like alien creature) in a ventilation shaft that DiFool managed to escape through as he was being chased by a wolf-headed man in a nightclub. The story begins with DiFool plummeting to what would have been his death when he is saved by the police, who interrogate him. Later that day, his house is stormed by Bergs and a giant robot. DiFool escapes, but he is immediately apprehended and is taken to the floating palace of the “Prezident.” He escapes once again by hiding in a train headed for Technocity. In Technocity, he embarks upon his first quest: to acquire the Black Incal. He is captured once again and is nearly slaughtered and dissected by the techno-pope, leader of the technopriests. The technopriests are right out of The Protocols of the Elders of Zion: a sinister elite who hold secretive rituals (chanting “Hail Darkness!” all the while), and they are plotting to destroy the universe by launching “Shadow Eggs” into the atmosphere. DiFool’s loyal pet seagull, Deepo, rescues him by shattering the technopope’s crown. DiFool finally obtains the Black Incal after defeating a giant beast. Meanwhile, Tanatah, Queen of Amok, orders the Metabaron – the greatest warrior in the galaxy – to capture DiFool and promises to release his son, Solune, in return. The Metabaron returns to the Lair of Amok with DiFool and Deepo, and Tanatah tries to have him and Solune killed. But she has a change of heart and decides to join forces with DiFool and the Metabaron after seeing that they are all being pursued by the Necrodroid (the Prezident in the form of a giant robot). The rest of the story follows DiFool, Deepo, the Metabaron, Solune, Tanatah, Animah (her sister), and Kill Wolfhead (the wolf-headed guy mentioned earlier) as they embark on a mad intergalactic adventure featuring flying leeches, singing crystals, giant jellyfish, interdimensional teleportation, human cloning, and holy androgynes. I will not spoil any more of the plot. There are a few nods to Dune: Iman Horlog – a fat, sadistic government official – is reminiscent of Baron Harkonnen; Greyfield, the Emperoress’ “mentrek,” is like Thufir Hawat; and Aquend is a planet consisting only of water, the opposite of Arrakis. The story gets zanier as it progresses, and nearly every page introduces a new plot device or technological oddity. Its drawback is that the plot lacks some cohesion. But the sheer imaginativeness of the tale and Moebius’ masterful artwork compensate for this flaw. Moebius is widely considered one of the greatest comic book artists of all time, and his gifts are on full display here. His style is both ornate and streamlined, richly detailed yet elegant, and economical. He also excels at depicting the surreal and the fantastical. The closest analogue to The Incal’s sci-fi zaniness and stylish visuals is Luc Besson’s The Fifth Element. 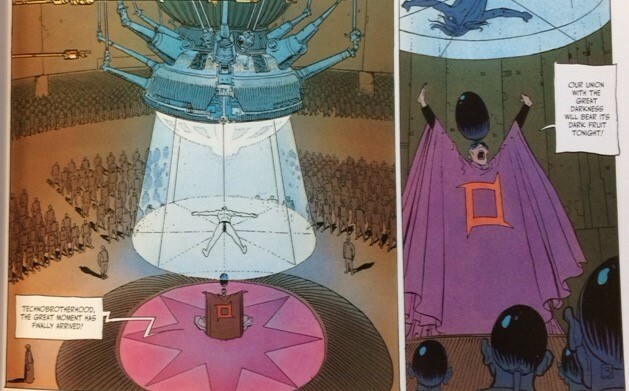 Jodorowsky actually sued Besson on the grounds that he ripped off The Incal. Moebius had worked with Besson, which probably accounts for the similarities there. The Incal’s influence can also be seen in the Alien franchise, as well as in Blade Runner, The Matrix, and other films. The central narrative of the book is one of journeying through the depths of hell to achieve transcendence and self-transformation. DiFool lives in a squalid urban dystopia characterized by anarchy, corruption, and vice. The Prezident is a lazy narcissist who uses television as a means of mass indoctrination. DiFool himself is addicted to “vhisky” and “homeo-whores” (prostitutes). This nightmarish landscape is explored further in Before the Incal, a prequel to The Incal that chronicles DiFool’s early adulthood and his career as a detective. DiFool’s mother is a prostitute who subsists on amorine (a “love drug”) and commits suicide at the beginning of the series. His father is a petty criminal whose memory is erased by the government after he is caught wearing a fake halo in imitation of “aristos” (the appellation for the ruling class). DiFool is forced to kill him before he transforms into a bloodthirsty murderer controlled by the state. The city itself is ruled by an omniscient computer called the Supra-Divinoid. Most of the population is addicted to SPV (another drug) and television. The government incentivizes citizens to fight in wars by offering them unlimited access to homeo-whores and vhisky. Customers at brothels can customize homeo-whores according to their preferences by picking features from a digital menu. The media are ever-present, and acts of violence are publicly broadcasted to appease the public’s need for entertainment, as are the Prezident’s multiple body transplants. When the insulation around the Supra-Divinoid’s diodes melts, causing a temporary blackout, the citizens go crazy and protest in the streets. DiFool decides that his first mission as a class “R” detective will be to investigate the mysterious absence of children among the homeo-whores of the Red Ring. He is motivated by his curiosity about the strange circumstances of his childhood; his mother was forced to lock him away to keep his existence a secret. This is a classified subject, and the Supra-Divinoid arranges for all witnesses to be destroyed. But DiFool is determined to solve the case. His companions along the way are Deepo, a kindly cybo-cop named Kolbo-5; an eye-cop (an eye-shaped, whirring device used for espionage); and a female aristo named Luz de Garra, who is his love interest. At one point, he also forms an alliance with a band of “psycho-anarchists,” one of whom is named Stirner. DiFool and his friends end up uncovering a sordid conspiracy encompassing every sector of society: the Prezident and his hunchbacked henchmen, the cybo-cops, the Supra-Divinoid, the Cocaloco Industries, and others. They discover the dark truth about the case of the missing children, which unmasks the aristos as a vampiric elite whose power is derived from the deaths of innocents. The remainder of the story ties up some of the loose ends in The Incal, such as how Tanatah stole the Black Incal and came to be the Queen of Amok. The ending overlaps with the beginning of The Incal. 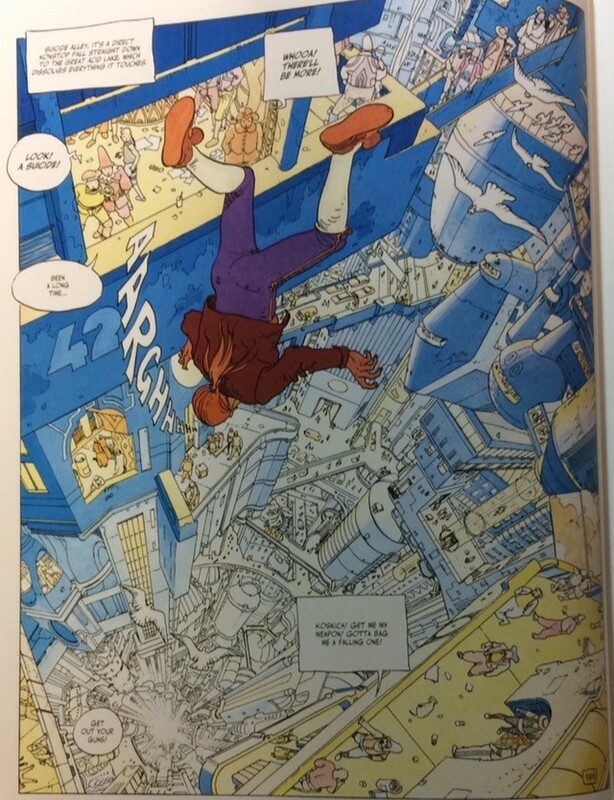 Before the Incal is less spectacular in scope than The Incal, and mostly takes place in the dystopian city-shaft where The Incal begins. However, the setting and characters in Before the Incal are more fleshed-out. Both are wild, fast-paced yarns packed with adventure, violence, bizarre technological creations, and a good dose of mysticism. In the first volume, DiFool encounters three versions of himself from alternate realities. Among them are an “enlightened” guru and a hyper-evolved angel, both of whom Jodorowsky pokes fun at. The one selected by the Incal is the ugliest and least enlightened version of DiFool. He absorbs the essences of the other DiFools and embarks on his quest. Moebius intended to illustrate the conclusion of the saga, but he stopped working on it after one volume. José Ladrönn went on to illustrate the story, which was reworked by Jodorowsky. The story is good, but Ladrönn’s artwork is stellar. The aesthetic is strongly reminiscent of Blade Runner. 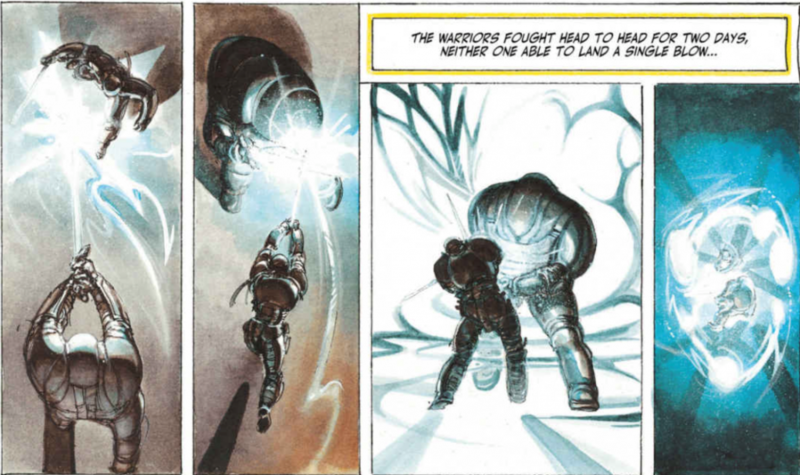 The saga of the Metabarons delves into the backstory of the character of the Metabaron, who was introduced in The Incal. It consists of four series: The Metabarons, Metabarons Genesis: Castaka, Weapons of the Metabaron, and The Metabaron. A role-playing game based on The Metabarons was also released in 2001. When Aghnar is of age, Othon puts him to the test by having him fight a giant robot and then mutilates his feet to test his pain tolerance. Thus begins the Metabarons’ tradition of mutilating their heirs in order to teach them to endure pain. The son of each Metabaron also receives a bird-shaped birthmark that symbolizes the Castaka dynasty. It calls to mind Jodorowsky’s own Santa Sangre, in which the protagonist’s father tattoos him with a phoenix (“Now you’re a man, just like me”). When Honorata is killed by Shabda-Oud priestesses for having defied their orders to bear Othon a hermaphrodite, Othon orders Aghnar to fight him to the death in order to ensure that he has what it takes to avenge his mother’s death. Thus begins a second tradition: each Metabaron must earn the title by killing his father. 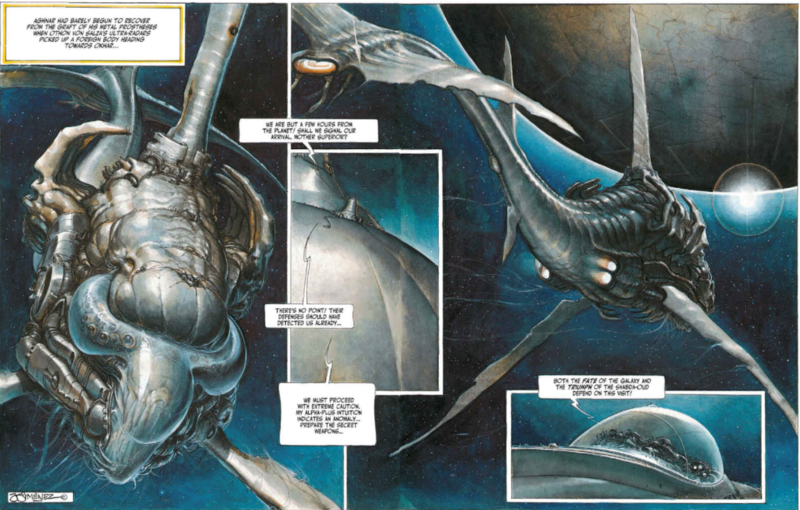 The Metabarons is not as trippy as The Incal, but it has own fair share of weirdness, especially when it comes to reproduction. For instance, Honorata transfers her soul to a princess named Oda and has a child with Aghnar (her son). Their son, Steelhead, seduces his wife, Doña Vincenta, by exchanging his prosthetic steel head for the head of a poet. She bears him conjoined twins, a boy and a girl, of which only one can survive. Steelhead saves the girl, Aghora, but implants the boy’s brain in her body. Aghora later gives birth to the next Metabaron by extracting male cells from her brain and implanting them in her womb. Aghora is basically transgender, but her character is not really subversive because she accepts the responsibilities of being a man and a Metabaron. Indeed, SJWs and feminists have objected to The Metabarons due to its glorification of patriarchy. The women in the story are strong-willed and powerful, but their ultimate purpose is to procure sons who will continue the Castaka dynasty. There are also scenes involving sexual coercion. There are some echoes of Jodorowsky’s philosophy of “psychomagic” in The Metabarons, particularly in the use of ritual to overcome adversity and psychological torment, and in the notion that one’s ancestors leave an imprint on one’s unconscious. Metabarons Genesis: Castaka chronicles the history of the Castakas in the three generations leading up to Othon von Salza. It is presented as a flashback in which Baron Bernard recounts the history of his ancestors. The central theme is their struggle to continue the Castaka bloodline. At the start of the book, the Castaka Queen is abducted and raped by the leader of a warring clan, who also sterilizes all Castaka men with a bioweapon. The battle between the clans has the air of a samurai film. The Queen’s son, Dayal, is banished by the Castaka King, but he manages to find a Castaka woman, who bears him twin daughters. His planet is destroyed by techno-technos, but he and his family hijack a techno convoy and head toward Thor-Thougah, a pirate asteroid, where a bloody war is fought. The struggle to preserve the bloodline continues when Dayal’s daughters become afflicted with malignant tumors, and he must graft the upper body of one onto the lower body of the other. The new hybrid daughter is impregnated by the last man alive on Thor-Thougah, Ulrich the Blond. Their child is Berard, who transfers the title of Baron to Othon, his son-in-law, endowing him with the Castaka birthmark. In Castaka, we also learn about the history behind the Castaka birthmark. It symbolizes Gangez, the former guardian of the epyphite of Marmola, who sacrificed his life to protect the secret of the epyphite when he was attacked by three bandits. Dayal gives him a proper burial; in return, Gangez offers his soul to him, and he is led to the epyphite. Weapons of the Metabaron is a short graphic novel in which the last Metabaron obtains three magic weapons: a sword, a golden chalice, and the “transpineal eye” (at the end, he himself is deemed the final weapon). It is the weakest link in the Metabarons saga, but is an entertaining romp through space nonetheless. The Metabaron meets a group of eight mysterious, hooded figures (“dream-shifters”) who inadvertently opened a portal to vampiric beasts called the Hulzgeminis, and who are now in search of a warrior who can defeat them and close the portal. They present him with certain trials he must complete in order to win his weapons. One of the enemies he must face is a tribe of lizard-men who feast on the blood of children. The Metabaron is a sequel to the main series and chronicles the last Metabaron’s war against the techno-technos, who have been profiting off epyphite extracted from Marmola, the land of the Metabarons’ ancestors. When the techno-pope finds out that the Metabunker is headed for Marmola, he appoints techno-admiral Wilhelm-100 as techno-governor and entrusts him with dealing with the Metabaron. The plot reaches a climax when the techno-techno armada invades Algoma, a hidden universe of epyphite, and the Metabaron makes a deadly deal with the Techno-techno Empire. Overall, The Metabaron comes close to being as good as the main series. The story is gripping, and Valentin Sécher and Niko Henrichon’s artwork is outstanding. The Metabaron’s disillusionment with his bloodline returns in this series. It is also revealed that Othon was instructed by the epyphite itself to guard it with his life and protect its location. Othon’s betrayal of the epyphite came to be his greatest regret. Jodorowsky has compared the Metabarons to the protagonists of a Greek tragedy: neither entirely good nor evil, but tragic heroes whose fate was sealed from the day that Othon fell under that block of marble: heroic and noble, but cursed by destiny. It is also worth noting that Othon’s motivation in betraying the location of the epyphite was to save his son’s life (not to obtain favor or material goods), which makes him even more of a tragic figure. There is an ecological dimension to The Metabaron as well. The techno-technos look upon nature with contempt and see both human biology and the natural world as things that must be overcome. When Orne-8 is castrated during his/her ordination ceremony as techno-cardinal at the techno-Vatican, the techno-pope declares that he/she is “freed from the slavery nature imposes on mankind.” The techno-technos are hyper-utilitarians who see epyphite as mere fuel for their vessels. But the epyphite is more than that: a living, breathing life force that underpins the universe itself. The Metabaron’s realization of this is what galvanizes him to fight the techno-technos again. Like The Metabaron, The Technopriests revolves around a lone rebel who takes on the Techno-techno Empire. 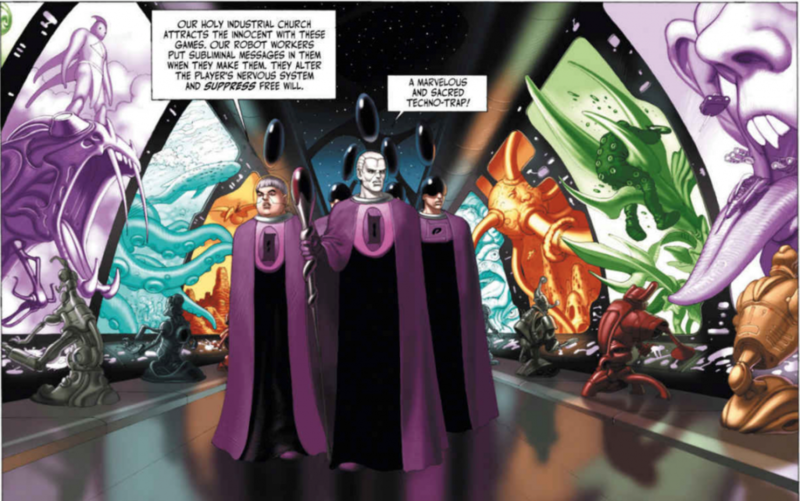 It takes the form of an extended flashback in which the Supreme Technopriest, Albino (with his murine companion, Tinigrifi, by his side), recounts his childhood and his mission to lead five hundred thousand technopriests to the “promised galaxy.” Though not the equal of The Incal or The Metabarons (a high bar indeed), The Technopriests boasts a compelling story and high-quality art, making it a worthy addition to the Jodoverse. Albino is the offspring of Lady Panepha, a high-born woman poised to become the oracle of the imperial palace before she was raped by a band of invading pirates. Her quest to exact revenge upon the pirates is a prominent subplot throughout the series. Because of his bright white skin, his mother sees Albino as a defective mutant and treats him as a slave. Albino turns to the virtual world and becomes skilled with computers. His dream is to create games that will transport people to other worlds. In techno-school, he is hailed as a genius, but his curiosity and imagination put him at odds with the system’s rigid bureaucracy. He is sent to a penitentiary after attempting to speak with Saint Severo de Loyola, the founder of the techno-ministry, who is locked away in a cybercrypt. Saint Severo recounts that when he founded the techno-ministry, his goal was “to bring light and knowledge to humanity,” but the technopriests perverted this aim by using technology to hoard power and tyrannize their subjects. Albino runs into trouble with authority again when he creates his first game, a psychedelic adventure that imbues players with wisdom and self-knowledge. He learns that in the Techno-techno Empire, games are designed to serve one purpose: to induce addiction, passivity, and apathy in citizens and trap them into becoming perpetual consumers. Albino decides that he must join the “techno-executioners,” who serve as the arbiters of games and are high up in the techno-papal hierarchy. Each techno-executioner has his brain removed upon his initiation, and all of their brains are plugged into a giant matrix. Saint Severo creates a replica of Albino to undergo the procedure, while Albino himself is sealed in a cybercrypt. Albino watches as his replica terrorizes “anti-techno” communities and people who consume media that is not state-approved. After five years, Albino takes control of the techno-executioners’ brains and forces them to recognize him as their master. Albino is eventually crowned supreme technopriest. As before, he plays along with the techno-techno agenda for a time, and he is forced to guard his soul against the forces of darkness on multiple occasions. Finally, his true mission begins: to defeat the Empire from within and guide his followers to a new galaxy. He selects his followers by means of a challenging game he designed that requires players to go on an odyssey across an empty planet, and finally through an aerial maze in space whose endpoint is Albino’s ship. Megalex is set in a hyper-industrial dystopian city-state (Megalex) in which nearly all organic life has been purged. The government rules over the populace with an iron fist, and the law is enforced by clones that were created in a lab and are programmed to retaliate against anyone who commits an infraction. Natural procreation is banned, and the entire population is genetically engineered. The clones who comprise the police are allotted four hundred days of life, while the upper classes are allotted four hundred years. The story begins with the creation of an “anomaly,” or a clone that went awry: he is ten feet tall. When this is discovered, the government embarks on a witchhunt for him, but he manages to escape down the root of a tree and into a secret underground world. Beneath the modern city of Megalex lies a two thousand-year-old labyrinth constructed by an eccentric genius. We later learn that Megalex used to be called Giragod and was a lush, fertile kingdom before it was devoured by a computer called the “mega-brain.” All that remains of Giragod is the underground realm and a forest that the royal family of Megalex are currently plotting to destroy. The rest of the story follows the “undergrounders” as they coordinate an attack on Megalex. Their leader, Zerain, is a charismatic warrior who acquires a bat’s wings. There is one scene in which one of the “undergrounders” brings back manna – which can be molded into any food using one’s imagination – from the world above. Zerain stomps on the manna and castigates his comrades for giving in to their individual wants, reminding them that the manna is the embodiment of everything they despise. Megalex is essentially a commentary on modern post-industrial society. However, the ending shows that Jodorowsky is not categorically opposed to technology. It is revealed that seven hundred million alien creatures are headed for the planet and will arrive in four years, and the royal family must use their advanced technology to create a shield to cover the planet. They resolve to create harmony between technology and biology. Megalex is the least compelling series in the Jodoverse, but it nonetheless makes for a good read. The shift from digital art to traditional comic art is abrupt, but one could argue that it mirrors the changing balance of power in the story. Beltran’s computer-generated art in the first two volumes is a good fit for the sterile uniformity of Megalex. The main theme that remains consistent across the Jodoverse comics is the search for transcendence, self-actualization, and authenticity in an inhumane, indifferent universe. Each character is engaged in a form of spiritual warfare. The enemy by turns takes the form of nihilism, greed, consumerism, ecological degradation, and one’s own weaknesses. This quest narrative is implicitly Rightist because it presupposes the existence of a spiritual hierarchy and glorifies the values of heroism, transcendence, and so on. This arguably makes Jodorowsky a fellow traveler of the Right. The Jodoverse is also free of PC moralizing, unlike Saga or Star Trek. I strongly recommend the Jodoverse comics (especially The Incal and The Metabarons) to fans of science fiction and great art. 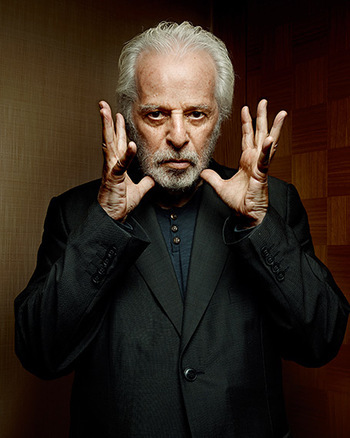 Dune fans, in particular, will appreciate Jodorowsky’s blend of science fiction, mysticism, and surreal weirdness. The spirit of Jodorowsky’s Dune lives on in the Jodoverse. 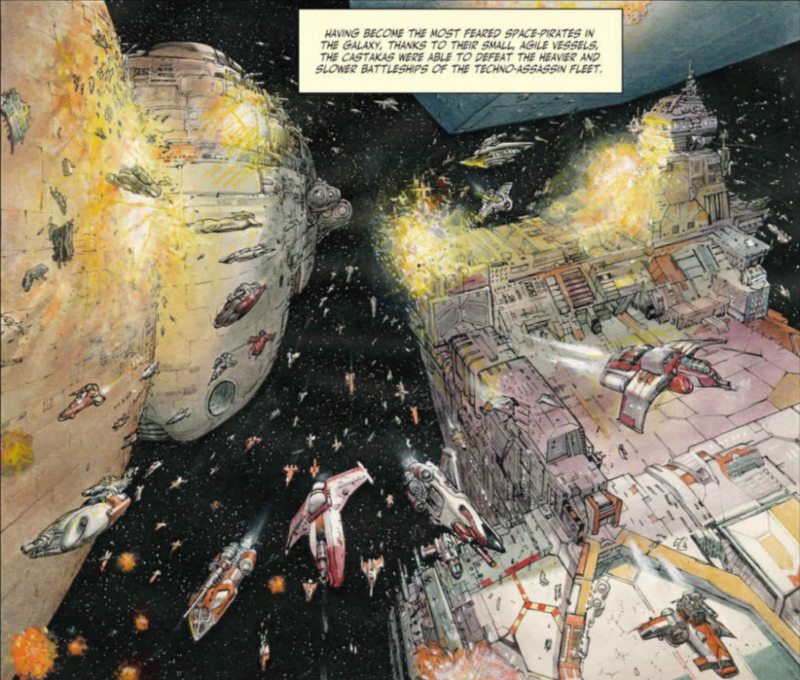 Published: April 16, 2019 | This entry was posted in North American New Right and tagged Alejandro Jodorowsky, Alex Graham, articles, Before the Incal, comics and graphic novels, Final Incal, Jodorowsky's Dune, Megalex, Metabarons Genesis: Castaka, Moebius, North American New Right, originals, The Incal, The Metabaron, The Metabarons, The Technopriests, Weapons of the Metabaron. Post a comment or leave a trackback: Trackback URL.